“MURDER City” — that was how the defunct Asiaweek described Davao City in the early 1980s. Each day, some two to three people were killed and thrown in the ditch. Foreigners and even those from nearby provinces shunned what became the country’s “killing fields” (a sobriquet bestowed to Cambodia once upon a time). In the foreign press, Davao City is noted for the bombings that happened in the city. San Pedro Cathedral, situated at the very heart of the city right across the Sanguniang Panglungsod (City Council) building, is the oldest church in Davao City. The city’s premier historical landmark, it now recognized as a National Cultural Treasure. On Easter Sunday of April 1981, two grenades were thrown into the congregation as the traditional Easter service was concluding. Floren Baltazar, who practically lived more than his life around the Cathedral selling religious items at the church ground, told Davao Today on what happened that particular day. “I can’t say how many died, but I remember that it took five fire trucks to clean up the blood, in the aftermath of the incident,” he was quoted as saying. Twelve years later, during a mass in December in 1993, another bombing incident happened in the same Cathedral. This time, only seven people were killed but about 151 others were injured, of which 32 of them were wounded seriously. Dory Flaviano, publisher of a Davao daily who witnessed the bombing, said there were three bombs that exploded. The first one blew up at the center aisle. The second bomb went off near the altar while the third one shattered the main entrance fronting San Pedro Street. A few days later, two motorcycle-riding men threw a grenade at a mosque, a few blocks away from the San Pedro Cathedral. Aside from the two bombings that happened in San Pedro Cathedral, two more bombings took place in the city: one at the Davao International Airport and another one at the Sasa wharf. On March 4, 2003, a bomb which was planted inside a backpack blasted in the waiting shed outside the old airport terminal building. Some 21 people were reported killed and at least 148 others injured. Almost a month later, another bomb exploded at the Sasa wharf. About 17 perished, including children. In addition, 56 others were injured. The most recent bombing happened in 2016 when a bomb exploded at around 10:20 p.m. on corner Padre Gomez Street and Roxas Avenue. More than 60 people were injured and left some 16 people dead. Today, the murder city is no longer such. In fact, it is now one of the world’s safest cities. Out of the 349 cities ranked by the website Numbeo.com, Davao City was the only metropolis in the Philippines that made it to the top 10. In fact, it was considered the fourth safest place. If the city has a high safety index, the website said, it is considered “very safe.” The safety index of walking alone during daylight in Davao City is 93.75 percent while it was 76.69 percent at night. It is now wonder why Davao City is now the trade and commerce center of Mindanao. It is just one hour and thirty minutes by plane from Manila (45 minutes if from Cebu City). Davao is also the gateway to East Asian countries, particularly Brunei, Indonesia, Malaysia, and Singapore. In 2006, Davao hosted the tourism forum of the members of the Association of Southeast Asian Nations. 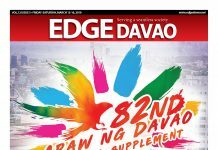 “Davao is slow compared to Hong Kong, Bangkok, Manila, and Cebu,” wrote Ernie Abella, editor of Madayaw, a magazine that was released in conjunction with the event. “But you can get from sea to mountain by the time you finish the juice of a fresh coconut.